Rosetta Stone, for those unfamiliar, are the makers of the oft-advertised language learning software of the same name. The 20-year-old Virginia-based company went public in 2009, and today makes learning software for over 30 languages that is used in over 150 countries. Its software aims to assist people of all ages in learning new languages based on its “Dynamic Immersion method,” which teaches various vocabulary and grammatical functions intuitively, rather than by drills or translation. Yet, over the last few years, a number of translation and language learning startups have popped up, and Rosetta Stone, in turn, has been increasingly looking to boost its digital offerings for a younger audience. That’s why today it is announcing that it has completed the acquisition of Los Angeles-based language learning startup, GoGo Lingo. Founded back in 2008 by Afsoun Yazdian, who developed GoGoLingo’s proprietary “Playful Immersion” method while at Stanford, a language learning method designed to help kids ages 3 to 7 learn Spanish through implicit absorption. And that’s why this acquisition makes so much sense for Rosetta Stone, as both companies have been focused on this implicit absorption model — although they use slightly different names for it — or teaching language adoption with the aid of pictures and sounds, and through immersive exposure, rather than giving people simple one-to-one translations. Using its marketing dollars to gain a wide reach — you may have seen its ads on TV, or at kiosks in airports and malls — Rosetta Stone has become one of the giants of language learning software. But new players have been threatening the company over the last few years by going after the digital distribution angle, which in turn hasn’t been kind to Rosetta Stone’s market valuation. As a result, Rosetta Stone has been on a mission to become more competitive in digital distribution, seeking new growth opportunities, and its acquisition of GoGo Lingo is likely just the beginning. 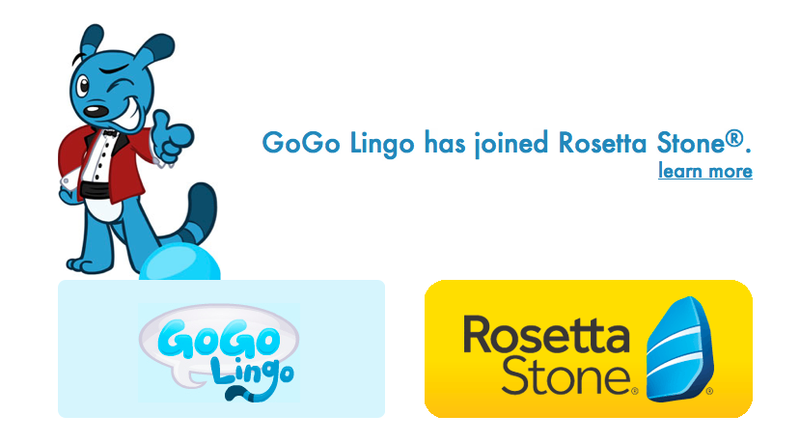 Rosetta Stone’s acquisition of GoGo Lingo gives it access to the startup’s characters, games, activities, and its digital infrastructure, which the company plans to incorporate into the assets of its future language learning solutions, according to its statement. The terms of the deal were not disclosed. While kids already use Rosetta Stone to learn new languages, GoGo Lingo’s model was explicitly kid-focused, developing its Playful Immersion techniques with kids in mind by using games, music and humor to allow them to engage them within a context that is tailored to their learning style. As Rosetta Stone says that it is accelerating its research into kid-specific learning solutions, and is looking for online communities and distribution media to do this, GoGo Lingo was an obvious fit. GoGo Lingo came out of the research founder and CEO Afsoun Yazdian was doing at Stanford, and she was later joined by co-founders Jason Leon and Dylan Squires, who themselves had been developing web properties tailored towards a younger generation. Over time, the team attracted a bunch of language learning experts, who helped the founders develop the solution. Going forward, Yazdian said in a message to her community, GoGo Lingo’s platform is no longer available, and its website has for all intents and purposes been wiped clean. The founders have all joined Rosetta Stone and will be helping the language learning company integrate its technology into upcoming products. For more, check out Rosetta Stone at home here, and the joint announcement on GoGo Lingo’s homepage here.